Bicycle! Bicycle! : The Colour Peugeot. It took quite a lot of willpower to not title this post after a Prince album. Despite the smaller wheels messing with expectations of perspective, this is actually an adult Peugeot brand bicycle in the 'shopper' style that is once again becoming popular thanks to manufacturers like Bobbin. I'd guess it's from the same era as the Indi 500 Family Bicycle, late 1970s or early 1980s? Its compact convenience even appears to be complimented by a basic folding mechanism as evidenced by the hinge on the down tube. 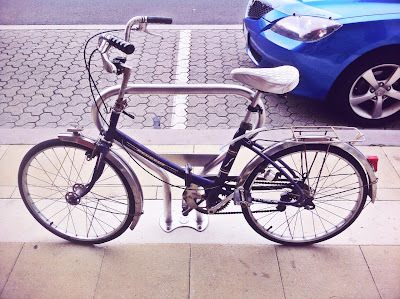 The Tasmanian rider of the Peugeot was young, hip and female - a cyclist almost as rare as her bicycle despite Devonport cycling infrastructure being the most comprehensive on the north coast. It made me smile because it's great to see increasing diversity amongst Tasmanian cyclists, hopefully the new spring weather will encourage all the less 'serious' riders to venture out on their bicycles and afford me more bicycle spotting opportunities! After escaping Perth with her bicycles intact, Fat-bottomed Girl Jen is busy making the rockin' world go 'round in Tasmania - just like those Bohemian Rhapsody guys.